Here’s the third in a series of guest posts from the wonderful Eimear. While visiting @1chicklette a few months back, we discussed pink wedding dresses and she suggested that I write a guest post for her on them. 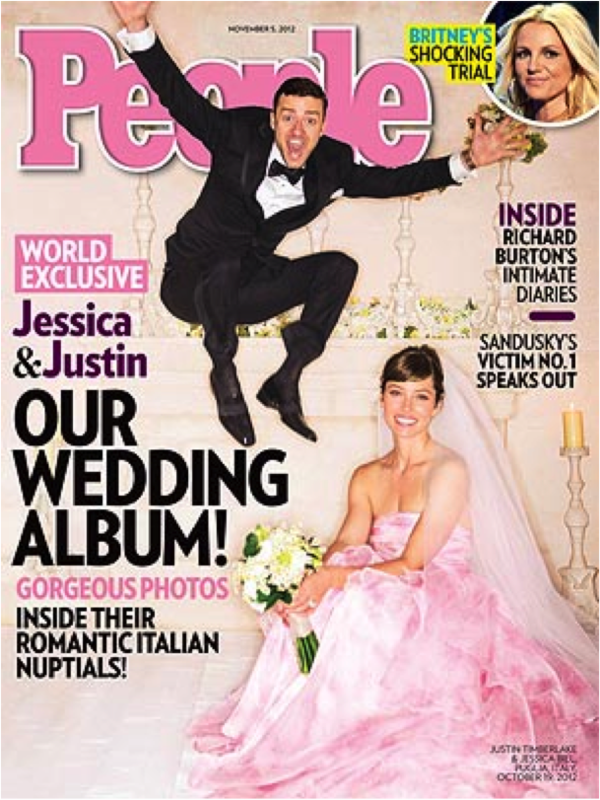 Lo and behold less than two weeks later, Jessica Biel married Justin Timberlake in pink, and posed for the cover with her new husband nearly kicking her in the head and making this post all the more relevant. Colored gowns have been in vogue for years. During World War I and II and in the post war periods, many brides could not afford expensive and elaborate lace and silk white gowns and many turned to colored dresses and smart suits. My own grandmother married my grandfather in a pale blue/gray suit nearly seventy years ago. When I got married off white was the color to have–mine was a cream, lace concoction). It seems more and more brides these days are embracing the color trend for their big day. Here are my best and worst celebrity colored gowns. Gwen Stefani marrying Gavin Rossdale in dip-dyed, custom Galliano. Gwen is a style icon for the ages in my opinion. Her beautiful gown was so innovative and true to her aesthetic. Reese Witherspoon marrying Jim Toth in pink Monique Lhuillier. Given that it was her second wedding and that she has two children, I wonder if Reese wanted to avoid the white ‘virginal’ look of a traditional dress? I really liked this look but honestly I really like Reese’s style in general. Many may say she plays it a little safe in her dressing, but I love her classic, preppy style and I often use her outfits as style inspiration. She has an ‘attainable’ look albeit with it very high-end designer pieces – Reese feel free to send me that adorable Bulgari purse you have been toting recently! Sofia Coppola, in the personification of hipster chic, married Thomas Mars in a purple Azzedine Alaia gown. I adored this ethereal look. Sidenote: Am I the only person who, upon hearing Alaia, thinks of the line in Clueless when Alicia Silverstone’s character Cher is about to be mugged in the Valley and is told to lie down rips open her coat and says ‘But sir this is an Alaia!’ It is my favorite movie ever. Here is the trailer for those who haven’t seen this genius movie. Amber Tamblyn married David Cross in mustard yellow – I adore Amber Tamblyn, I loved the low-key, down-home nature of this wedding but I hated the dress. She is such a beautiful girl and it did nothing for her at all. Sharon Stone marries Phil Bronstein in blush pink. Okay, again with the pink! I think I could have passed this dress because it was the 90s. Nobody dressed well then, but a PINK veil? And what person over the age of seven willingly chooses to wear a tiara? Finally Jessica Biel whose awful Giambattista Valli dress was so bad her new husband had to take the attention off her by jumping in the wedding pictures. It wasn’t the most offensive dress in the world, no, but it was just so much PINK. Which colored wedding dresses have you loved or hated? This entry was posted in Chick stuff, Style and tagged Alaia, Amber Tamblyn, Britney Spears, Bush, Clueless, dress, Eimear, Eimski, Gavin Rossdale, gown, guest post, Gwen Stefani, Jessica Biel, Jim Toth, Justin Timberlake, No Doubt, pink, reese witherspoon, Sharon Stone, Sofia Coppola, wedding on January 21, 2013 by onechicklette.